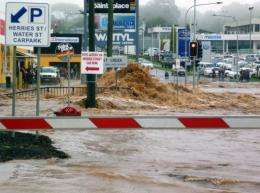 A flash flood is seen in the centre of the Austrlian city of Brisbane. Sea levels are set to rise by up to a metre within a century due to global warming, a new Australian report said Monday as it warned this could make "once-a-century" coastal flooding much more common. Sea levels are set to rise by up to a metre within a century due to global warming, a new Australian report said Monday as it warned this could make "once-a-century" coastal flooding much more common. The government's first Climate Commission report said the evidence that the Earth's surface was warming rapidly was beyond doubt. Drawn from the most up-to-date climate science from around the world, the report said greenhouse gas emissions created by human industry was the likely culprit behind rising temperatures, warming oceans, and rising sea levels. Its author Will Steffen said while the report had been reviewed by climate scientists from Australian science body the CSIRO, the Bureau of Meteorology and academics, some judgments, including on sea levels, were his own. "I expect the magnitude of global average sea-level rise in 2100 compared to 1990 to be in the range of 0.5 to 1.0 metre," Steffen said in his preface to "The Critical Decade". He said while this assessment was higher than that of the Intergovernmental Panel for Climate Change in 2007, which was under 0.8m, it was not inconsistent with the UN body which had said higher values were possible. "We're five years down the track now, we know more about how those big ice sheets are behaving," Steffen told reporters. "In part we have some very good information about the Greenland icesheet. We know it's losing mass and we know it's losing mass at an increasing rate. "So that's telling us that we need to extend that upper range a bit towards a metre. Now there are commentators who say it should be even higher than that." The report said a sea-level rise of 0.5m would lead to surprisingly large impacts, with the risk of extreme events such as inundations in coastal areas around Australia's largest cities of Sydney and Melbourne hugely increased. Steffen said in some instances, a one-in-a-hundred year event could happen every year. "The critical point is we have to get emissions turned from the upward trajectory to the downward trajectory by the end of this decade at the very latest," he said. "We have to make investment decisions this decade to put us on that long-term trajectory that minimises the cost to our economy." The report found that Australia, prone to bushfires, drought and cyclones, had also likely felt the impact of rising temperatures in recent years. In the last five decades the number of record hot days in Australia had more than doubled, increasing the risk of heatwaves and bush fire weather, it said. Chair of the Climate Commission Tim Flannery said the evidence was becoming more convincing year by year that humans were changing the climate. "In Australia we are seeing the impacts more clearly, we've seen the sea level rise that was predicted, we've seen the decline in rainfall continue particularly in the southwest of Western Australia, we've seen impacts on the Great Barrier Reef and so forth," he told reporters. "This is the decade we have to act." Prime Minister Julia Gillard, who is struggling in the polls as she seeks to introduce a carbon tax to place a price on industry's production of greenhouse gas emissions, seized on the report. "We don't have time for false claims in this debate. The science is in, climate change is real," she said. You can't throw a stone without hitting a part of this statement that is misleading, incorrect, or merely opinion. There's almost nothing accurate or complete from beginning to end. I can't believe the political battle that's going on in Australia right now. This spin piece is no better than the spin pieces coming from the opposition. The amount of money at stake makes this kind of silliness inevitable I guess. Strange dont you think that after 25 years of catastrophic warnings, its the media that are now left as the only ones acting like climate change is still a global emergency, having to resort to writing their own stories of global gloom instead of the usual lazy copy and paste journalism they excel at so well. Science has walked away from climate change as we see them watch in silence as Obama never even mentioned the crisis in his state of the union speech and as all American IPCC research funding for climate change science was pulled. If this was real science, the scientists would have been marching in the streets to regain support for their climate mitigation action that they said we needed to avoid their promised h e l l on earth from human CO2. The so-called Climate Commission is a Labor government-appointed committee of known climate alarmists, selectively appointed to further the cause of global warming alarmism! This anti fact/anti science paper was a predictable and predetermined last gasp to push a business/economy killing carbon tax in to Australia by a thoroughly discredited group of CAGW alarmist members and an intensely disliked Labor government who lied to get into power, like there will be NO carbon taxes if I'm elected PM Ju-lier Gillard, who once elected has done every thing to bring in that HATED ETS TAX! I think everybody should take anything they say with a grain - no a bolder size piece of salt! What's most offensive is (climate commissioner) Will Steffen suggesting the scientific debate is over. That's nonsense because there is a very lively scientific debate about the role of human-induced Co2 emissions in climate change. When they refer to "Climate Change" they are actually referring to their belief in Catastrophic Anthropogenic (human induced) Global Warming. When they refer to "carbon pollution" they are actually referring to carbon dioxide, which as we all know is the stuff we breath out and that creates the bubbles in beer. Their continual use of the word "Carbon" to describe carbon dioxide is the biggest travesty of all in my books. And incredibly there are so many MANY people I have spoken to, one of them unbelievably is an engineer, who think the government is trying to reduce "carbon emissions" (black sooty stuff) and find it hard to accept it is actually the odorless colorless trace gas carbon dioxide that is being demonised. CAGW Alarmist favorite words are: MAY it is possible, it may lead to, is likely to lead to, in all probability there will be, etc etc etc... Safe & recyclable words! 1979 NCAR Forecast : Sea Level MAY Rise 15-25 Feet Before The Year 2000 - What the? Dr. Stephen H. Schneiders one of IPPC leading alarmist of Climategate fame and Al Gores best buddy's has hedge his scientific bet since the 1970' with end time predictions such as Global cooling and the next ice age was coming to Global warming and the great floods his favorite word is MAY! Boy he's been at the grant trough for a long time see the 1970's video! There are so many Doom and gloom examples - It's like the preacher who just predicted the end of the world - one problem he's still here and so are the CAGW alarmist! These are facts not doom and gloom troll's religion. You didn't have time to go to the links and video's I provided. So you let your reflex AGW beliefs take over! at least give me a link I will have the curtsy to take a look! MAY Climate be with you! Current sea level rates are at 1mm/yr. They did rise to 2mm/yr between 93 and 05, but even at that rate, it would not make the amount predicted in this article. This article is junk science wrapped up in propaganda from alarmists. Who cares? The foul smelling rabbles always die first when something bad happens. For us the rich, influential and powerful, we can always ditch our seaside mansions and go to our mountain reatreats, funded by their tax dollars. Ahh, those evil, arrogant scientists! Using qualifiers like "may" to indicate that they aren't 100% certain about any theory, and showing a range of possible scenarios (0.5-1.0m)! How dare they! They should be more like this crowd, fully certain in their stance regardless of any lack of training, expertise, evidence, or research. They should use more non-sequiturs, and constantly accuse their opponents of feeding at the public trough. Then they'd truly be worthy of praise. They should be more like this crowd, fully certain in their stance regardless of any lack of training, expertise, evidence, or research. Fully certain that they haven't seen the kind of quality, definitive evidence that it would take to justify crippling economic and social policy? Sure. One doesn't have to be an expert or do their own research to make one's own judgement on the quality and scope of evidence one's been presented with. One only need be an astute student of scientific methodology and able to understand pretty basic physical principles. Understanding human motivational factors and behaviors doesn't hurt either.